The Governor of Sverdlovsk Oblast Yevgeny Kuyvashev congratulated the head coach of the volleyball club "Uralochka" Nikolai Karpol with conferring the title of Hero of Labor of Russia. Russian President Vladimir Putin signed a decree on awarding him the title of Hero of Labor for special merits to the state and people. The Governor wished Nikolai Karpol health, inexhaustible energy, happiness, prosperity, and new sports and life victories. "This high award is the recognition of your outstanding achievements in Russian sports, your long-term tireless work, professionalism, unique talent, and human gift. More than half a century, you faithfully follow your vocation - coaching. Together with millions of Uralians I share the feeling of pride to be your countryman and contemporary. It's people like you who create and redound to the glory Urals,” the greeting says. Trainees of the volleyball team first entered SYNH in 1976. Since then, dozens of athletes have studied at the Institute. They are the Olympic champions – 1980 Elena Andreyuk and Svetlana Kunasheva. Today, Uralochka-NTMK team consists of 10 students of Ural State University of Economics. This year, the athletes for the fifth time won the final games of the Youth Volleyball League. 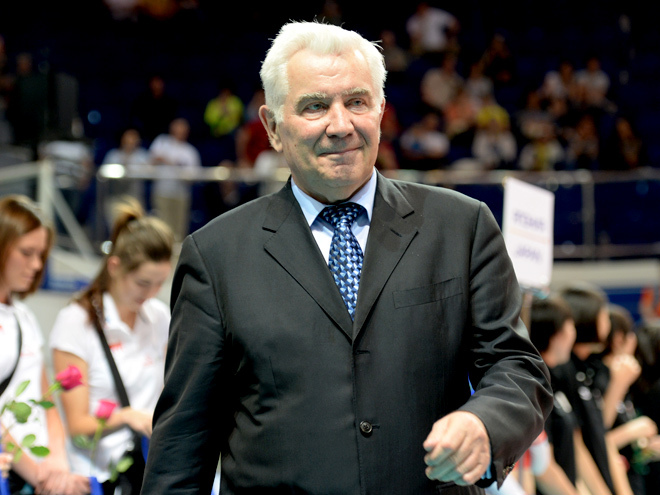 We would like to note that Nikolai Karpol holds the title of Honored Coach of the USSR and the Russian Federation, is a laureate of the Order of Friendship of Peoples, an honorary citizen of Sverdlovsk Oblast and Yekaterinburg. In 2009, he was inducted to the Volleyball Hall of Fame in Holyoke. May 1, Nikolai Vasilyevich turns 80 years old. Губернатор Евгений Куйвашев поздравил главного тренера волейбольного клуба «Уралочка» Николая Карполя с присвоением звания Героя Труда России.